The distinction between the two states and the unemployment rates in the various counties is pretty interesting. 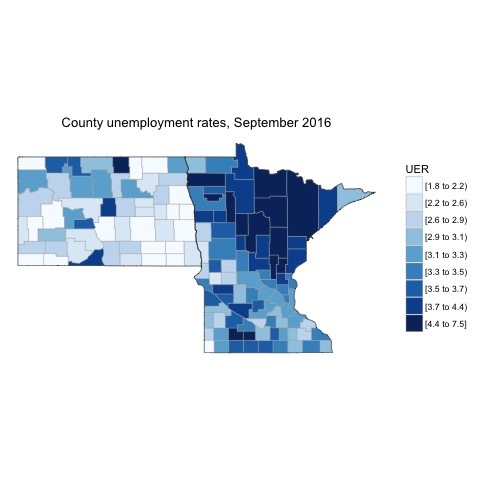 There is a sizable portion of higher unemployment (which to be fair is not high by historical standards) in the north and northeast of Minnesota. There are not many patches of higher unemployment in North Dakota and this still fits with my impression that North Dakota has too low an unemployment rate. This is not a plea for policy that puts people out of work. From my perspective it speaks more to the futility of policies intended to attract companies into the state. There is not the pool of available workers, at least under the traditional definition of unemployment, to give employers the hope of quickly filling positions. This should be a bit of a deterrent to firms since they might fear the need to raise wages to attract more labor. It is not an absolute negative, but another cost item that firms consider in decisions like production locations. That should also give pause to governments attempting to attract firms with incentives and other give aways. On the income side the picture is a bit different and very interesting. There are two clusters of higher pay, the Bakken area and the Twin Cities area. Now obviously these two maps cannot show labor market adjustments and dynamics so we need to leave those discussions aside for now. However, there is a diffusion of the higher level of annual pay by county than the unemployment. That is, the higher unemployment rates appear clustered together more than the higher annual pay. I’ll need to give some more thought to why this might be the case, and of course I need to generate some more maps to see if this is a one time phenomenon, or if it occurs on a regular basis.